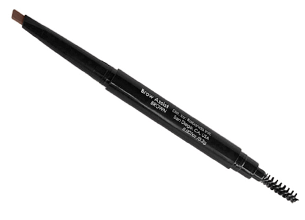 A long-wearing mineral based double-ended automatic brow pencil and brush with a unique triangular shaped tip for shaping and defining the brows. Availability: Perfect 10 Nail & Body, Placecol Skin Care Clinics and Dream Nails Beauty. You can also head online, www.placecol.com. I use this product daily as I have a dent in my eyebrow from a childhood accident. I have a gap in my eyebrow where the hair doesn’t grow and this brow assist is amazing at helping to cover it up. I can’t go without it. I generally don’t use brow products as I have naturally thick eyebrows that don’t need to filled in but just need shaping. So when I saw the brow assist I was curious to see what it could do for me. Upon applying the brow assist to my eyebrows I noticed that it definitely was pigmented. I just filled in my brows here and there for some added thickness and combed the hairs with the bristled brush. I was quite impressed that it darkened my eyebrows considerably to match my hair colour and gave it an added “oomphhff”. The brush is soft and not scratchy and combed my brows perfectly. It doesn’t have a smell and is the perfect size to fit in your hand. The packaging is sleek and white as is with all bodyography products. The colour lasted the entire day and only came off when I washed my face in the evening. It didn’t smudge or move the entire day! I will definitely repurchase it when I’m out of this one though the only problem I’d have is the shade range. Online they only have about 3 shades to choose from which is hard for someone who does not fall into that shade range. I would definitely recommend this product to anyone who has dark brown to blonde eyebrows.